Love can grow just about anywhere. You need look no further than the moving business to confirm that that’s true! Local moving agencies are often family-owned small businesses, which means that you’ll often find multiple members of the same family working in the office or on the crew, including husbands and wives. How do they keep love alive through the strain of their daily work? This Valentine’s Day, we’re celebrating the love of a few of our husband-and-wife Wheaton agency teams. 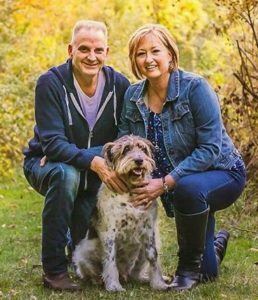 These power couples consistently deliver excellent customer service while navigating the sometimes blissful, sometimes challenging experience of working alongside their spouse. Here are a few of our favorite love stories! Ahmed and Sherry on their wedding day. Sherry Julin and Ahmed Issa run Ahmed’s Moving Express, a Wheaton agency in San Rafael, Calif.
Sherry: We met at our small neighborhood grocery store, checking each other out in the checkout line. 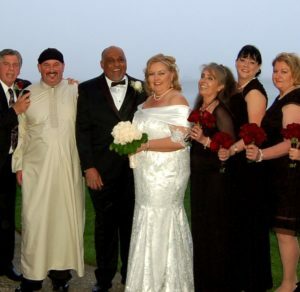 Sherry: We have been together 18 years and February 15th will be our 4th wedding anniversary. 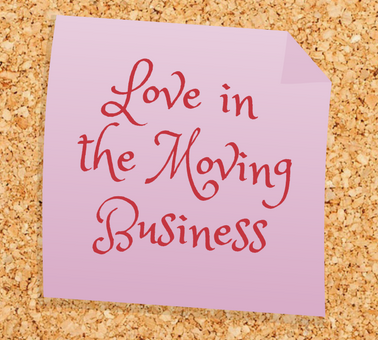 What brought each of you to the moving business? Sherry: Ahmed established his company in 1989 and has been growing the business ever since. He needed help managing the office and all the behind-the-scenes tasks. I was ready for a change with a small business I had for 20 years and we decided to give it a try. Twelve years later, we are going strong! What do you like about working with your spouse? Sherry: I get to see Ahmed’s smiling face all day every day! He is proud of the work that I do and he is constantly reminding me how good I am on the phone with our customers. Sherry: Talking shop after hours. How do you keep the spark alive – personally and professionally – especially on difficult days in the office? Sherry: We both love what we do so it’s easy to be together. We keep affection in the office to a minimum and make up for it at home. Do you have Valentine’s Day plans, and if so, what are they? Sherry: Ordering takeout Indian food and watching the Warriors game. Keith & Cindy with their furry friend. Cindy & Keith Benthin are the owners of Mulder’s Moving & Storage, a Wheaton agent in Kalamazoo, Mich.
Cindy: We met when we were teenagers. Keith was the college roommate of my brother-in-law to be. After being family friends for years and both of our first marriages ending, Keith would offer to relocate me to my new home. Keith literally swept me off my feet and we knew we were meant to be together forever. 10 months later we were married in the barn where we previously attended square dancing parties! 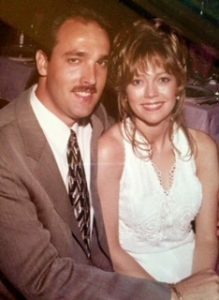 Cindy & Keith: We were married on 10/7/1989. We have enjoyed 28 years of marital bliss! Cindy & Keith: We are probably in the minority, but we really love spending every minute together no matter what we are doing. Together at work, we strive each day to create a culture of excellence for our employees as well as for our customers. Through our strengths and weaknesses we seem to balance each other out. 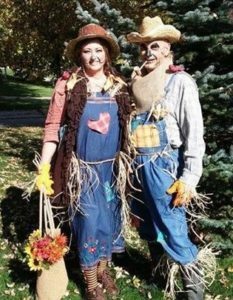 Cindy & Keith in costume! Cindy: I guess if there was one thing that is challenging it would be that I am a “detail brain” nerd, and if you have ever met Keith you would know he is a very free spirit! Cindy & Keith: Business as usual… There is never a dull moment around here! Cindy & Keith: Boundaries! Punch out, check out! Limits on office talk outside of work. Lunch dates on the weekdays. Love notes. We also double as each other’s therapists, shoulder to cry on and comic relief as needed. Cindy & Keith: We enjoy celebrating with our little valentines! We have two awesome grandsons, Ayden (9), Jackson (4) and the bonus of a third baby on the way! Woohoo! They make every day of our lives extra sweet! Bill & Tamara on their wedding day. 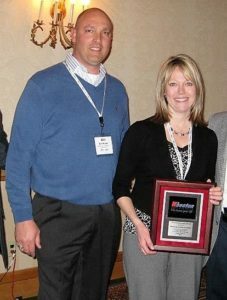 You can find Tamara and Bill Kissel at Bell Moving & Storage, Inc., our Wheaton agent in Fairfield, Ohio. Tamara: We met in March 1995 at the Wheaton Regional Meeting in Atlantic City, NJ. Best Wheaton meeting take-away everrr. Tamara: It will be 22 years in August. But it counts as double since we work together, so that will make it 44! Tamara & Bill: We were both born into our family moving and storage businesses (Tamara in Cincinnati, Bill in Pittsburgh). Bill & Tamara at a 2013 Wheaton Regional Meeting. Tamara: Is this a trick question?! Let’s see, I’ll say sharing common career goals and bouncing ideas off each other. Bill said that he gets to buy my lunch most days! Tamara: We figured this out during the first couple of years. Very important — offices at opposite ends of the building and we do NOT drive to/from work together. How do you keep the spark alive – personally and professionally – especially on difficult days in the office?Tamara: Humor. And lots of it! Plus, he’s very handsome. Tamara & Bill: We do this year – headed to the beach! What a wonderful Idea. Enjoyed reading about each couple and how they work together. You are Blessed.